Sony's CDP-CE275 Compact Disc Player will make the perfect addition to your sound system. Featuring Play 1 - Exchange 4 capability, CD-R/RW Playback capability, and Jog Dial control with Direct Access track selection, this 5 Disc CD Changer lets you enjoy your favorite music at the touch of a button. Additional features include a 20-Track Music Calendar, 32-Step programming, Peak Search, and a Hybrid Pulse D/A converter. Listen as Sony delivers musical magic with the CDP-CE275. I got this CE-275 in 2015 when my brother died. It sat in the box for three years till my Sony CDP-212 player went in for cleaning and adjustment. WOW! A great player. Strengths- it plays all CD-R and CD-RW discs, has a frequency response of 2hz-20khz (+/- 0.05dB), THD of 0.0045%, signal/noise ratio of 102dB, dynamic range of 93dB, CD exchange during playback, peak search and time fade. Also offers; all disc repeat, all track repeat, one track repeat, program play, random play/shuffle. Plus that sleek Sony styling, reliability and ease of use. The user manual can be downloaded from the Sony website. As my dad would say, it's the bees knees. Weakness- no remote, but so what? Are you too lazy to get up and work the controls?? Plays CD's, CD-R's, CD-RW's. Wonderful sound quality for the price. Sound is similar to more expensive units. Nicely built and laid out---easy to use. No remote control (If you have a SONY receiver or universal remote, this is not a problem). A little slow changing disks. 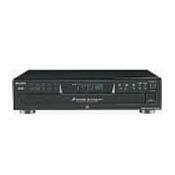 For $89 the SONY CDP-CE275 5 disk CD changer is a very pleasant surprise. It has the same build quality as all SONY non ES CD players. For a basic unit the CDP-CE275 has excellent sound quality and features. A real bargain!